Howatch, whose 20 novels have sold more than 20 million copies worldwide and have been translated into 23 languages, received the Doctor of Letters (Litt.D.) from Hope on Friday, May 25, in London, England. 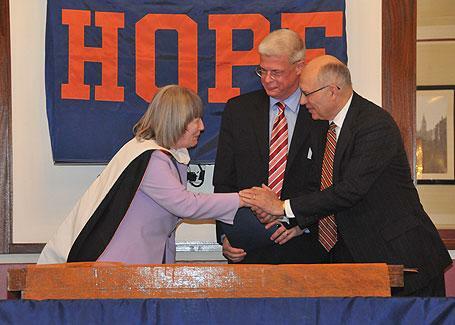 It was conferred by President James Bultman, presented during a gathering that included the students and faculty of the college’s London May Term Program as well as alumni and friends of Hope from the London area. Emeritus faculty member Dr. Charles Huttar has conducted scholarly research focused on Howatch and her work for several years. He noted that her thematic focus, informed by thorough research and deep insight, matches well the college’s own on-going emphasis on preparing students for life in a complex world through an education informed by faith. He sees a concern with moral issues and issues of knowledge across her work, especially in “Starbridge Series,” set in a fictional cathedral town, and the “St. Benet’s Trilogy,” set at a fictional modern healing center in London. The citation presented at the award ceremony further praised Howatch’s work in other forms, including essays and public presentations, as well as her reflection on the relationship between Christian faith and scientific inquiry and for modeling authorship as a kind of Christian service. The latter is particularly meaningful for Huttar, who retired in 1996 after 30 years on the Hope English faculty and appreciates the college’s success in preparing students with the same sensibility. Howatch, who is 71, was born in Surrey, England. She earned a law degree at King’s College in London in 1961 and clerked for a year, but subsequently turned to her primary interest of writing. She moved to the United States in pursuit of her career as a novelist. Her first six books were romantic mysteries, starting with “The Dark Shore,” published in 1965, and continuing through “The Devil on Lammas Night,” published in 1970. She next wrote several “family saga” novels focusing on multiple characters and generations, starting with “Penmarric” in 1971 and continuing through “The Wheel of Fortune” in 1984. “Penmarric” was adapted to BBC television in 1978. Howatch relocated to Ireland in 1976 and then back to England, near Salisbury Cathedral, in 1980. Her conversion experience followed, Huttar noted, and informed her subsequent books. The six-volume “Starbridge Series” began with “Glittering Images” in 1987 and continued through “Absolute Truths” in 1994. The three-volume “St. Benet’s Trilogy” began with “A Question of Integrity” (titled “The Wonder Worker” in the U.S.) in 1997 and continued through “The Heartbreaker” in 2004. In the 1990s, she provided an endowment to establish the Starbridge Lectureship in Theology and Natural Science at the University of Cambridge in England. Since the publication of “The Heartbreaker,” Howatch has been retired from writing. She lives again in her birth town of Leatherhead in the county of Surrey.